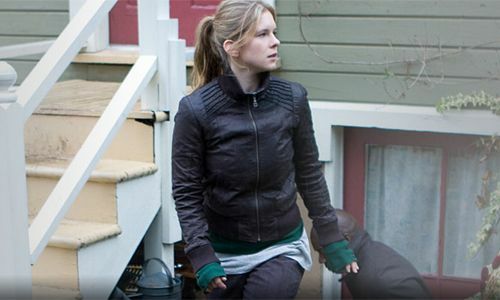 Cultural Wormhole: Caprica - "Things We Lock Away"
Lacy Rand (Magda Apanowicz) outside Sister Clarice's home. I'm trying hard to like 'Caprica', but it's not making it easy for me. I like it when sci-fi shows or movies try to break stereotype, but sometimes it feels like the creators of this show are trying a bit too hard. They are trying to instill a feeling of weight and importance, that it's predecessor 'Battlestar Galactica' had. It doesn't seem to be succeeding and episodes like "Things We Lock Away" do not help matters. The whole Lacy locked in Clarice's attack subplot was drawn out too long. Was this just an excuse to have some blurry, arty camera work to simulate Lacy's drugged condition? Why as Clarice drugging her? There were a few quick shots of Scott Porter making what appeared to be sympathetic and comforting gestures to her, but nothing was really expanded on this. Was there some sort of good cop/bad cop section to all of this that got cut out? What's the problem with Clarice's husbands' attitude towards Lacy that was hinted at? This subplot would have been more effective if Clarice initially sat down and told Lacy that to make up for the assassination attempt, she was going to have to pledge allegiance to the sister and then go off to STO training on Gemenon. We finally get the meeting between a more realized Tamera avatar and the Zoe avatar. Now the basic idea of personal identity and whether or not someone who is a copy of another is responsible for his or her crimes is an intriguing idea. However, these scenes were repetitive and got annoying. Tammy screams about being dead. People shoot and stab Zoe. Wash. Rinse. Repeat. Also, Tammy's conversing to Zoe's side of the argument felt a bit too quick. What really bugged me about the New Cap City sequences this episode was the introduction of another Zoe. We have the original Zoe that died in the bombing in the pilot. We have the avatar that was living in U-87, but is now in New Cap City. Now we have some sort of imaginary friend spawned from a traumatic childhood incident? This is over-complication and I don't see the benefit of including it in this episode. I don't know who is splicing together the commercials over at Syfy, but they really dropped the ball last night. I'm watching 'Stargate Universe' and the ad for 'Caprica' comes on and totally spoils the ending of "Things We Lock Away"! They actually show Vergis making Daniel kill him! So when the scene finally occurs at the end of the episode, the tension and suspense is totally drained out. Then again, the outcome was heavily telegraphed. Having Vergis and Graystone team up against the Tauron mob would have been a far more compelling and exciting idea. Brains vs. brawn. Technology vs. tradition. Two bitter rivals forced to work together to survive. And better yet: robots vs. mobsters! Instead we get Daniel with more blood on his hands and more guilt. I've been really trying to give the creators of 'Caprica' the benefit of the doubt, but my resolve is wearing thin. They have a third of the first season to really give me an idea that this going somewhere. At the moment, the show and the concept feels directionless and without a sense of what kind of show they want this to be.